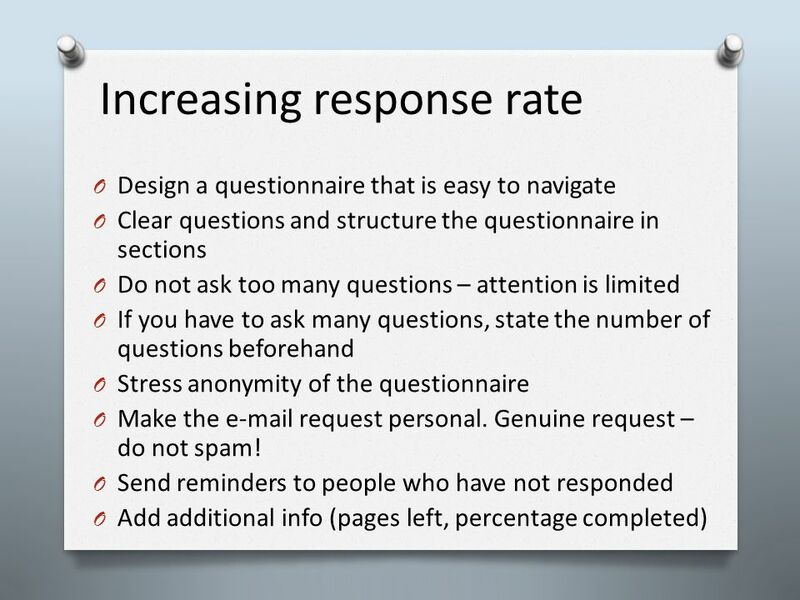 What makes a good questionnaire. Stages of a questionnaire: 1. 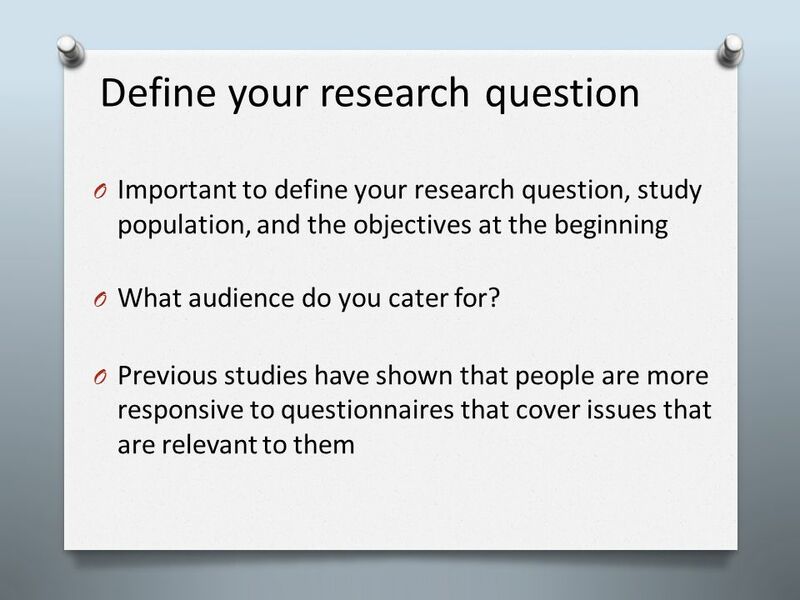 Define your research question 2. 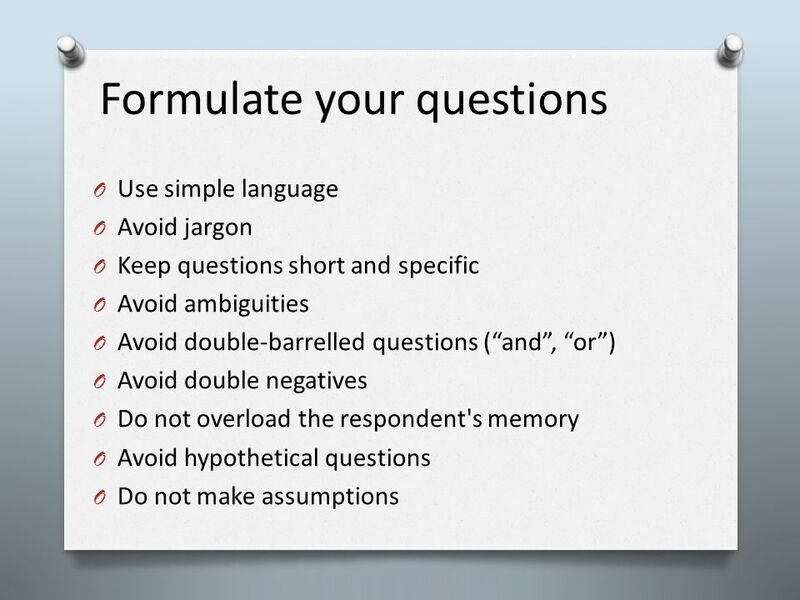 Formulate your questions 3. 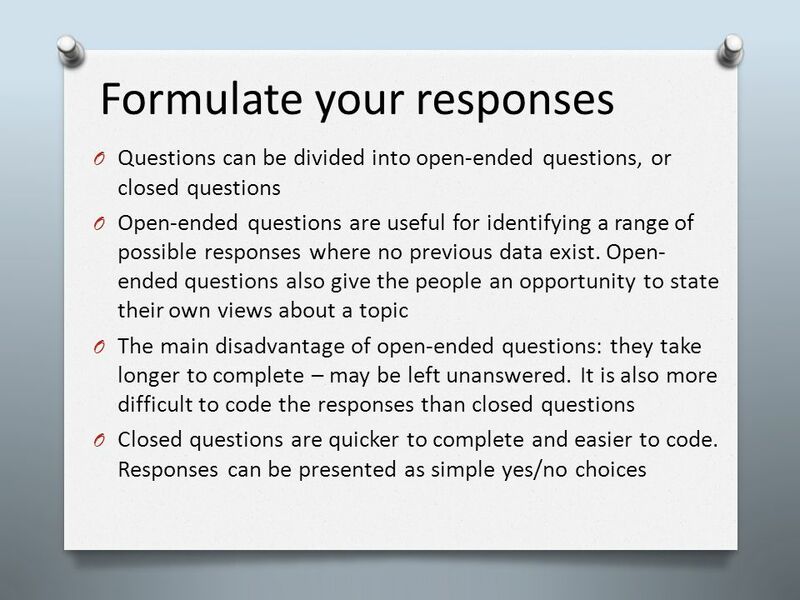 Formulate your responses 4. 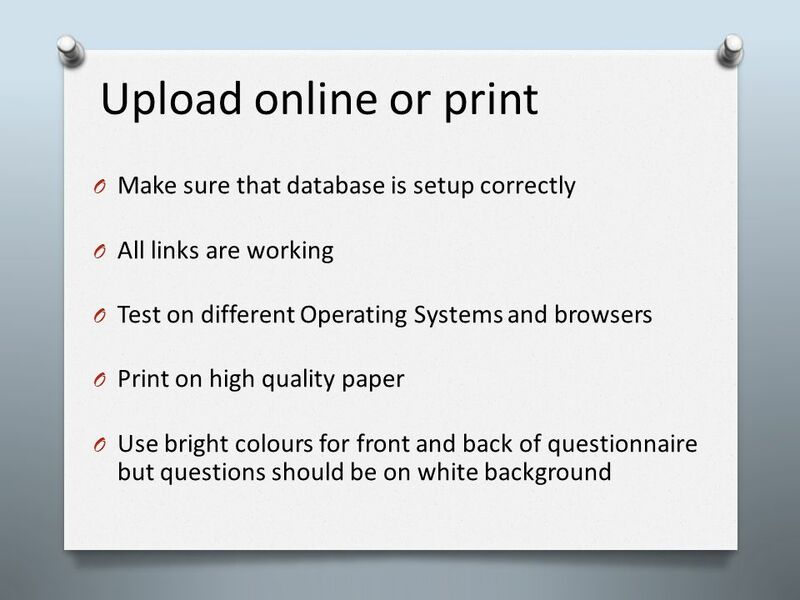 Download ppt "What makes a good questionnaire. Stages of a questionnaire: 1. 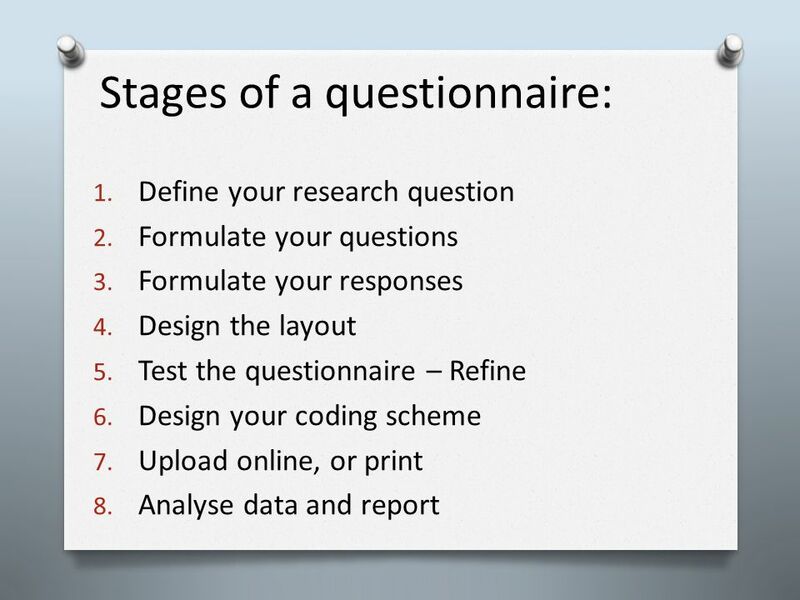 Define your research question 2. 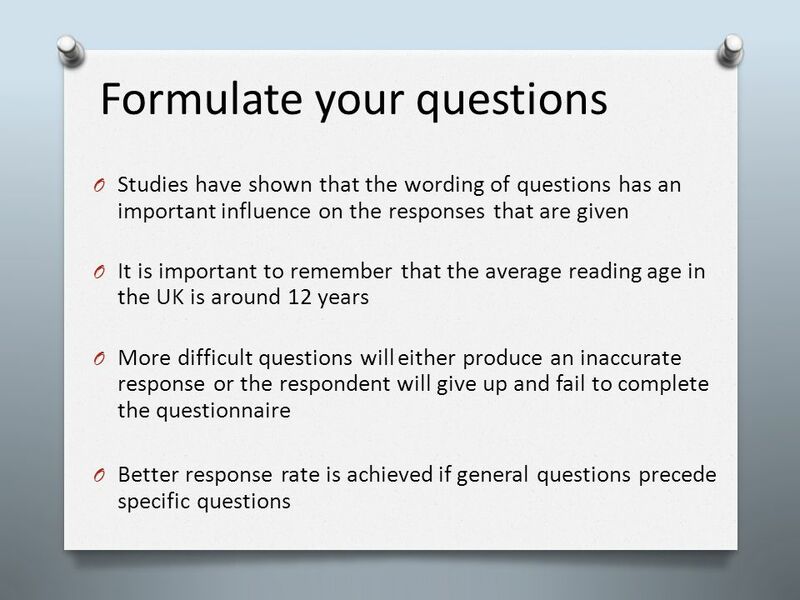 Formulate your questions 3. Formulate your responses 4." 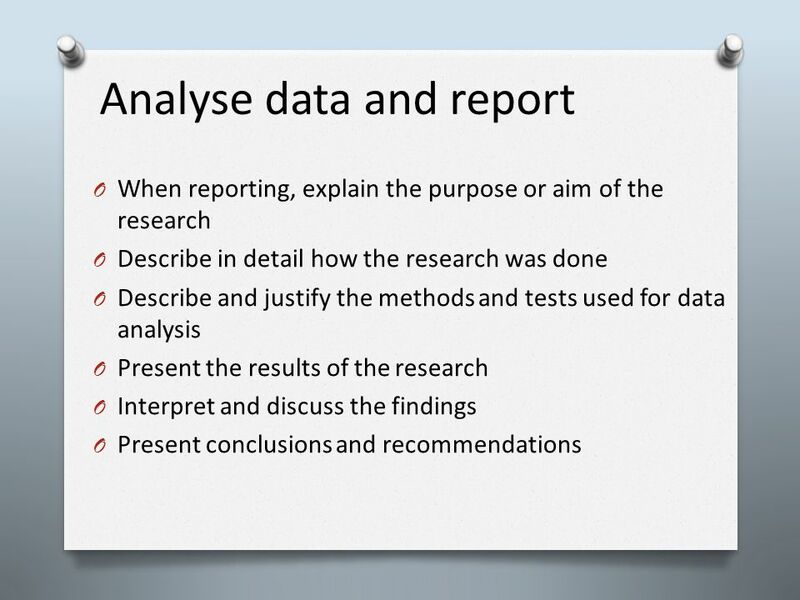 Chapter 11 Direct Data Collection: Surveys and Interviews Zina OLeary. Searching for literature online Today we will go through some ways of obtaining published papers directly from the internet Today we will go through some. 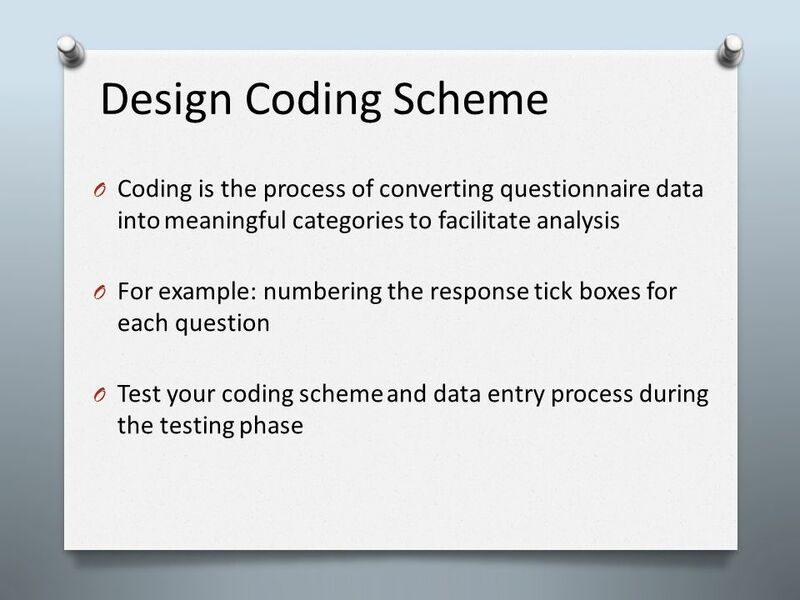 1 Questionnaire design Module 3 Session 3. 2 Overview (of Session) This session starts by introducing some aspects that need to be considered when designing. 1 © 2009 University of Wisconsin-Extension, Cooperative Extension, Program Development and Evaluation Surveys. 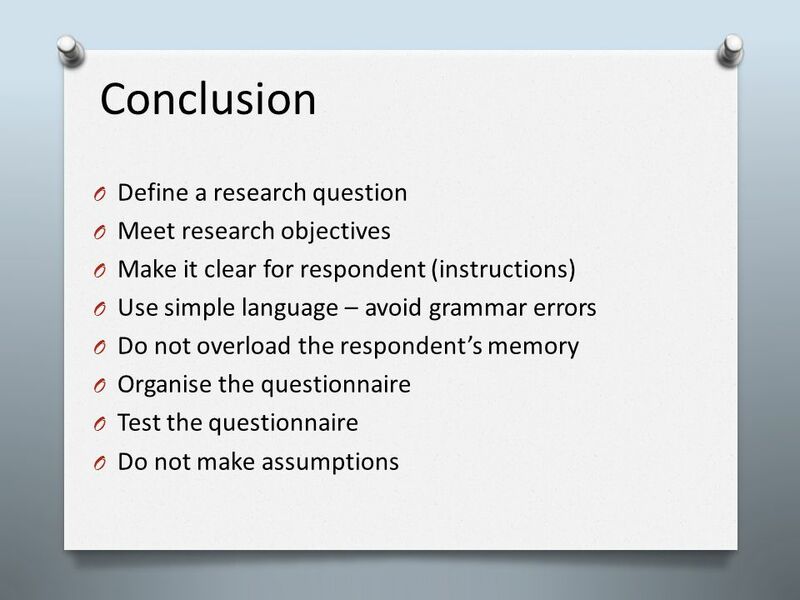 Key Steps to running a survey. Aims and Objectives Have clear aims and objectives for the project. Ensure you know what you want to get out of the survey. Bridging Research, Information and Culture An Initiative of the Research and Planning Group for California Community Colleges Your Name Your Institution. S URVEY D ESIGN 101 Gay Hylton Institutional Research and Planning. DT Coursework By D. Henwood. User Research Findings. 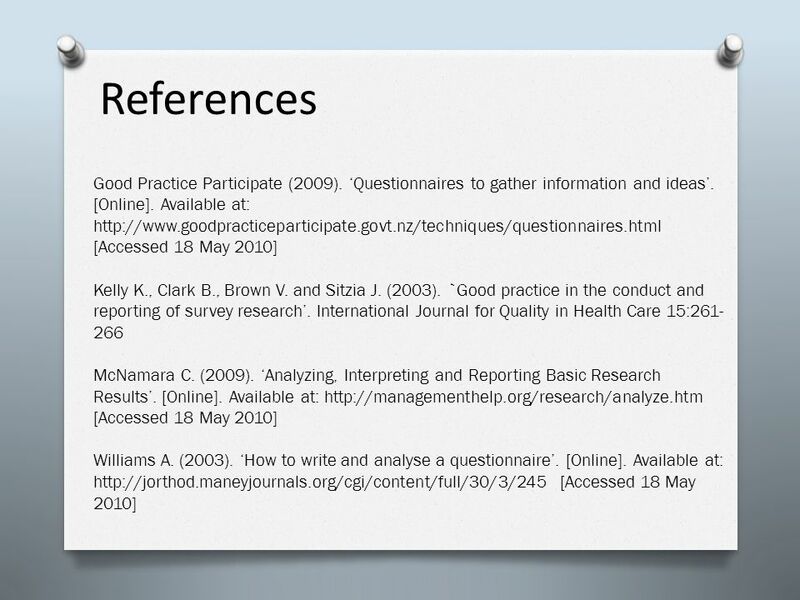 1 Overview Background Study goals Methodology Participants Findings Recommendations. Publishers of original thinking. What kinds of academic writing are there? There are many kinds of writing that originates from academia. In my view there. Resource is divided into 8 parts: 1. 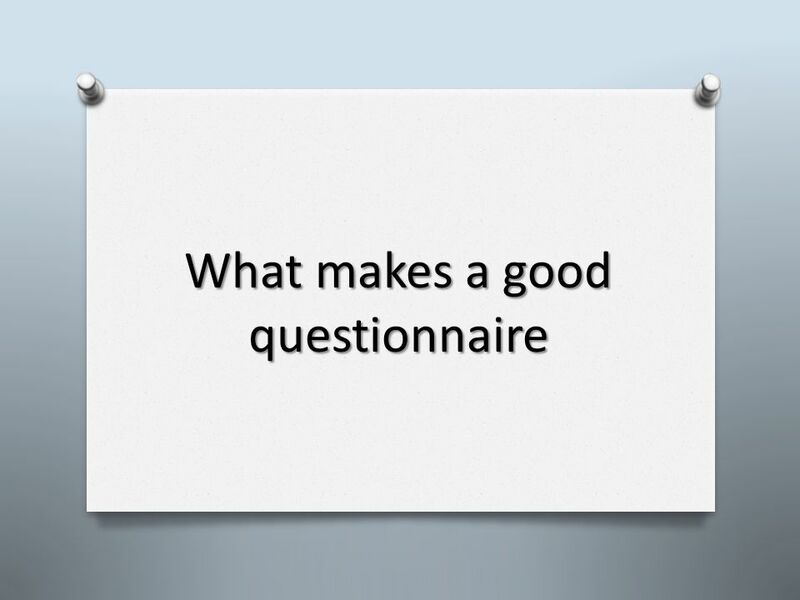 Part 1 – What Makes a Good Questionnaire 2. Part 2 – Installing Survey Software 3. Part 3 – Creating the First Survey. Using Surveys for Assessment Best Practices in Assessment February 9, 2012. 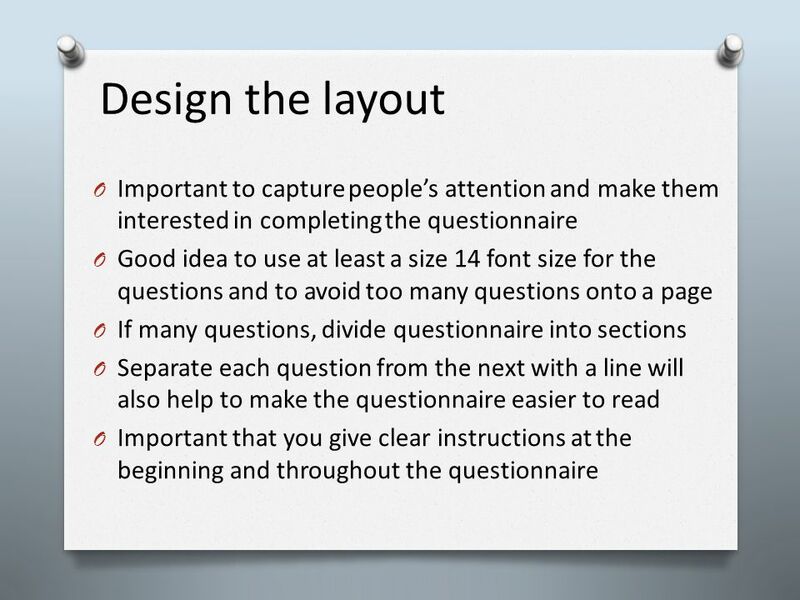 Designing Effective Surveys. Conceptualizing Your Research Conceptualize your primary research; Figure out what you need to know If you need information. CHAPTER 15 Questionnaires. 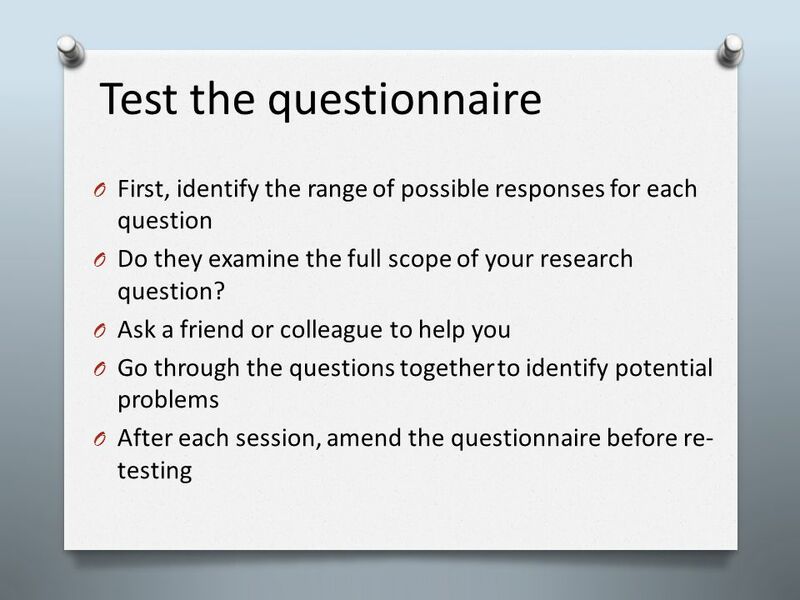 What is a questionnaire? 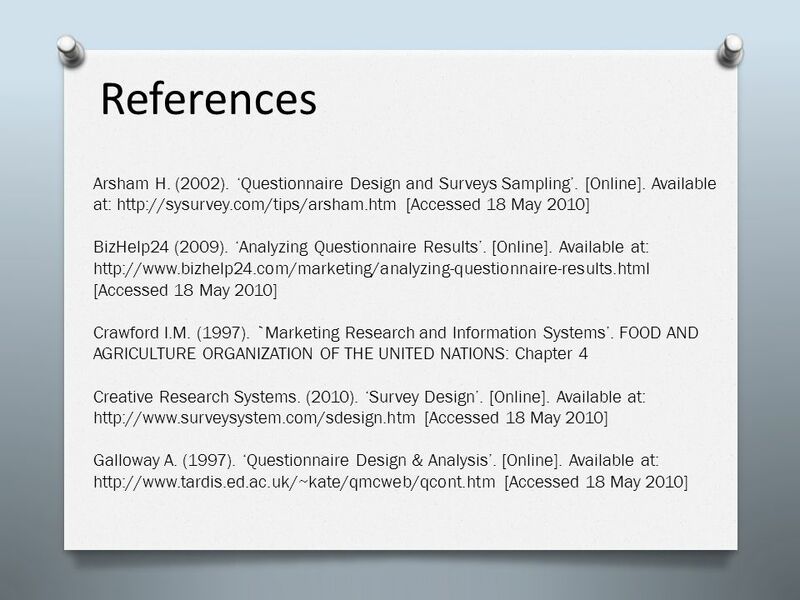 A questionnaire is a means of gathering survey data from a large number of people A questionnaire.